VSI (Virtual Storage Integrator) 6.2 is Out, XtremIO is IN! On the heels on the Mega Launch event in which we announced XIOS 3.0, another product release has just been GA, the VSI plugin. if you are an EMC customer and never heard about it, it’s really time to wake up, this (FREE!) plugin is really a framework for the EMC products for VMware vCenter, at it’s core, it allows you to view storage array metrics and provision VMFS datastores or RDM’s devices, present them to the ESXi hosts and all of this without using the storage GUI. this release is the first release that support XtremIO AND the vCenter web interface, prior releases supported XtremIO but only worked with the classic vCenter. but this release has also another feature which ‘im proud to say was co-invented by Tamir Segal who is a PM in our XtremIO team and your’s trully. 2. snapshot this volume X amount of times. 3. present the snapshot to the ESX’s cluster and renaming the VM’s, run sysprep on them and upload their computer account configuration to the VDI broker. 4. repeat it on the other snapshots..
and so, we went with this request to the VSI team and they made it possible, so you see, I’m Xtremly happy now because this platform called “XtremIO” is so unique and it allow us to really think outside of the box and leverage technologies in a way that was never done before! by the way, there is an even extra value in this plugin if you work with Citrix XenDesktop and EMC XtremIO since there is no native way in Citrix Studio to create full persistent clones! 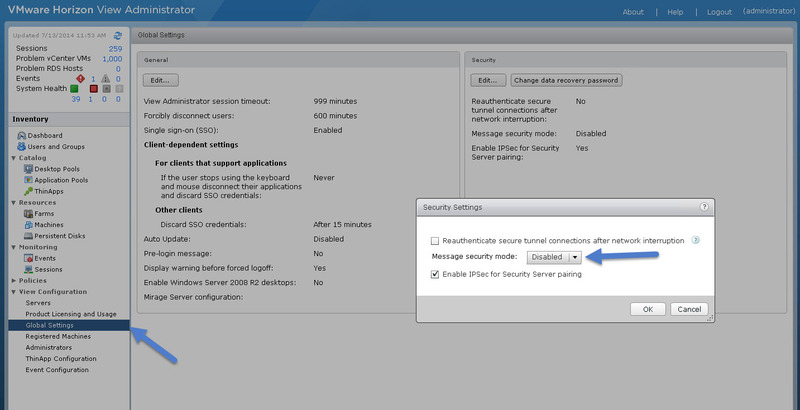 in order to make the VSI VDI plugin to work with Horizon View, you will need to disable the message security mode (as the vm’s creation and communication about it is coming from an “external” source to Horizon. Next Post Next post: Got OpenStack And XtremIO, You just got Cindered!